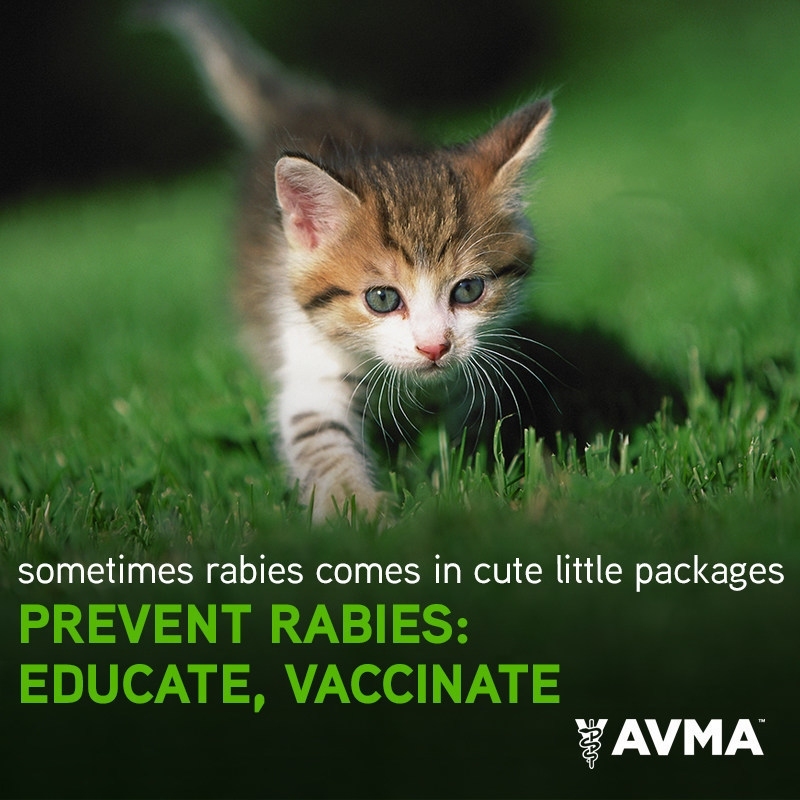 ​The American Veterinary Medical Association (AVMA) is celebrating the 10th anniversary of World Rabies Day on September 28 by urging the public to remain vigilant and follow six simple rabies prevention tips to protect people and pets. AVMA celebrates World Rabies Day with tips to protect people and animals from this deadly disease. “Because only one to three rabies cases are reported annually in the United States, it is easy for people to become complacent and forget that the threat is real,” said Dr. Tom Meyer, president of the AVMA. According to The Centers for Disease Control and Prevention, 80 to 100 dogs and more than 300 cats are infected annually with rabies and have the potential to expose an unknowing public. These are most likely unvaccinated cats and dogs infected by wildlife. Because the United States has emphasized vaccinating pets for rabies since the 1950s, most people do not realize rabies is a huge problem in much of the rest of the world. It is estimated that rabies kills more than 60,000 people every year; approximately 40 percent of the victims are children. Keeping pets free from rabies helps to keep people free from rabies. Dr. Meyer says that while dogs and cats can pass the virus to people, exposure to bats is the most common cause of human rabies cases in the United States, while raccoons are the most frequently reported rabid wildlife species (accounting for 30.2 percent of all animal cases during 2014). Keeping bats out of the home, and avoiding wildlife in general, is key to avoiding infection. Vaccinate dogs, cats, ferrets and select horses and livestock against rabies. Don’t let your pets roam free, where they may come into contact with rabid wildlife. Bat-proof your home and other structures on your property. Don’t leave exposed garbage or pet food outside. It will attract wild or stray animals. Don’t keep wild animals as pets. Keep your distance from wildlife and stray animals … even the cute ones! To learn more about rabies and World Rabies Day, visit the AVMA World Rabies Day page, which features links to information on vaccination and a podcast on rabies research. For more information, contact Sharon Granskog, AVMA assistant director of media relations, at 847-285-6619 (office), 847-280-1273 (cell) or sgranskog@avma.org.